After 30 years of ownership thgtne06872 a true GTS in silver and black is being placed for sale. This is a Southern CA car that has never seen a rain storm or water wash.It has been garaged and covered or left out in the elements. All original paint, interior, tool bag, DeTamaso/Ford manuals, wipers and spare tire. 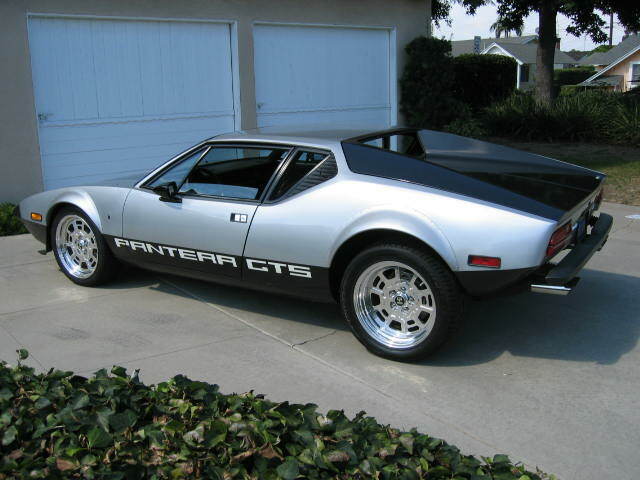 The car includes a Fluidine radiator and fans, electronic MSD ignition,850 Demon carb,New Boyd 17" with Pilot Sports, recent brake caliper rebuild, master cylinder and clutch assy by Pantera International. The suspension has been powder painted and Cad plated.Rubber bushings replaced with urathane and Koni coilovers. All accessories are fuctional, motor runs strong, 7kmi on motor. Included in the purchase are the original 9"& rare 10" Campys wheels. She is ready for a new home with someone that has more time to drive her. Photos are avalible and any questions can be answered.